state of the gaiters post ride was surprisingly good Weather was sensational, cool and sunny with little wind and Sqig and I enjoyed a successful completion of the 85km St. Albans endurance ride in NSW, Australia. most of the track was great underfoot. The considering the continual stretching and pulling that Sqig deals out. The small tear that had started in one of the gaiters before the ride (see Preliminary Gaiter Feedback, 22nd May) did get bigger as expected during the ride but was not as bad as expected by the end (see photo 2). The materials in the gaiters are clearly a lot stronger. 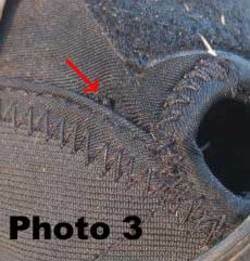 When the old gaiters tore at the velcro stitching (see photo in previous post), it would very quickly become a large hole though I would just continue using the holey gaiters as we never lost a boot but it did make the gaiters very, very loose. Therefore I'll continue using this damaged gaiter for another endurance ride plus training before consigning it to the bin. 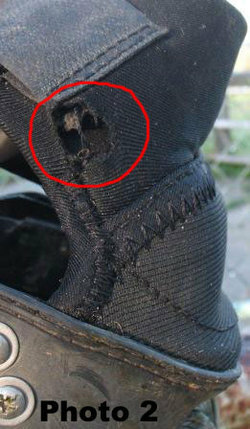 A new development is the tearing that is now occuring in a different place on the gaiter (see photo 3). 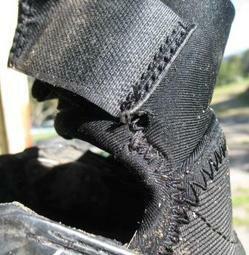 The neoprene has started to give at the reinforced stitching that goes across the lower part of the gaiter. This has only occurred on one side of two gaiters. I wish I had marked the boots but my guess is that they were on the front feet. Rubs wise, well I can report a mixture of good and not so good. The good: a big yeehaaaa, yay, no rubs at all under the gaiters on the back feet for the whole 85kms! Not even hair rubbed back, I couldn't find any signs of any rubbing and boy I did search. All we did before the ride was generously cover the gaiter with Curash, the baby zinc powder. The not so good: unfortunately the gaiters on the front legs rubbed on both side of the pastern for each leg. 2 small rubs at each front corner. At the end of the first leg of 50km, the hair had been rubbed completely away in small areas and the skin was pink but not broken. Couldn't risk allowing the gaiter to rub on unprotected skin for another 35km so we decided to use sportstape (see photo 4 of sportstape at a previous ride). This worked well and stayed in place despite riding through sand, mud and water and we were able to successfully finish the ride. I think it is worth having a look at photo 5 to see the kind of stretching and pulling that Sqig deals out to the gaiters. Look at the range of movement in his stride at the trot, one ergot looks like it is almost on the ground! It is a wonder that the gaiters last at all. 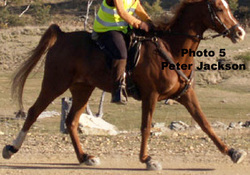 This photo by Peter Jackson was taken at a different ride but is good for showing the punishment that gaiters receive. 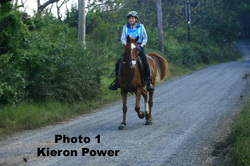 We don't trot that fast for too long at any ride but he was on a mission at that moment. If you are interested, to get the animation to work you have to click on the graphic and it will open in its own window. I bought some of the new gaiters and have mainly positive comments to report (my 2 cents worth). I have found the new gaiters are so much easier to use with fitting Bares (yay!) now that they will fold and stay out of the way and due to the choice of fabrics they are less fragile than the older style gaiters. It is interesting the way the gaiters sit on the Bares, they appear to sit slightly lower on the pasterns which looks like a good thing for my horse as the old ones sat quite high. So far I have only done about 100km (62 miles) over several outings as I'm training my horse for his first endurance ride which is on this weekend at St. Albans, NSW, Australia. Fingers crossed all will go well. 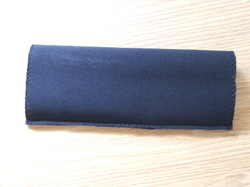 The photo on the right shows one example of an older style gaiter with the tear in the neoprene. And just for a bit of fun, an animated graphic of my horse, Omani Mr Sqiggle moving (hope this works). Animation by kieron Power. Can't wait to trial the new Edges. CTR organisation accepts hoofboots with gaiters! We had a lot of support for our resolution and amendments to our resolution were proposed by other members during the meeting. In the end, the result was even better than expected. Now, all hoof boots can be used (so not just Easyboots, but Old Macs, Boas, etc) and the penalty assessed will now be 1/2 a point per boot. The vets reserve the right to ask that the boot be removed, but they generally do not unless there is a very specific issue (i.e. 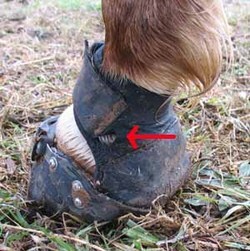 if a lameness problem developed they might ask to see the horse without the boots). 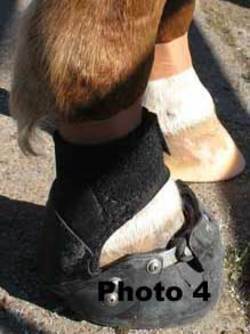 We will have to open the gaiter (or in the case of the Old Macs or Boas, open up the boot a little) at each check so that the vets can see whether any tack lesions/rubs have developed because we could still be assessed a penalty point for this (like any other piece of equipment worn by the horse). The distinction has also now been clearly made that hoof boots are hoof protection, not leg protection, and should not be considered in the same manner as splint boots, bell boots, bandages (all of which are penalized at a higher level if used in CTR). I was so excited at this development (much time and energy over the past two years has been put into this to), my eyes watered up when the whole thing was finally passed. Such a relief. Yeehaw!! Bring on the boots! hahaha At least now we are not taken out of the running before even getting out on trail. Just thought I would share - I know this issue has been discussed in other CTR organisations and some still do not even permit Easyboots (!! ), so hopefully this might encourage others to continue pushing for rule changes in this regard.